Suffice it to say, I've been dying to try Minx for the longest time. Seriously, what gal doesn't want her nails totally blinged out? Never one to shy away from crazy nail endeavors (remember my experience at Sakura? 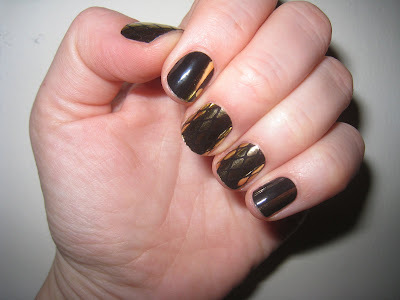 ), Minx seemed the next obvious choice for a fun, totally out there mani. Luckily, the fabulous Tracylee Percival was there to create one of the most amazing designs ever. Now, for those of you who aren't familiar with Minx, the basic idea is this. Minx are sticker-like coverings that are made out of a flexible film. Read very closely -- they are not liquid! There's no drying time, no smudging and chipping, and they're definitely not for the faint of heart. Just look to celebrities like Beyonce and Eve, who have been known to wear Minx on multiple occasions. Get the full scoop on my Minx experience after the jump. Tracylee actually provides Minx applications at two different salons -- Suite 303 and Damone Roberts. I visited her at the former location -- located on the 3rd floor of New York's Chelsea Hotel -- and the space is so fun! Guitars and music memorabilia decorate the walls, loud music fills the room and every stylist is totally rocker-chic. As soon as I settled into my chair, Tracylee set out about 50 different designs for me to choose from. Each set of Minx comes on a sheet of 10-12, with different nail sizes on each. Just as I thought I had decided on a herringbone pattern, she said, "You know you can mix and match these, right?" I did not know that, which of course made me take about 10 more minutes to make my final decision! Luckily, Tracylee was very patient throughout the process. 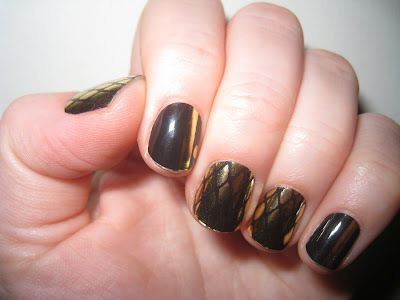 I finally decided on a combination of Black with Gold Swoosh and Ball and Golden Lightning with Black Fishnet. I told Tracylee to make the assortment as random as she wanted -- I left the creativity up to her! This is where things got interesting. Tracylee decided to make each hand different -- "I like a little asymmetry!" she told me as she held the coverings up to my nails. After prepping my nails with an Essie Crystal File, she placed my hands under a heat lamp -- it gets up to 120 degrees! -- and went to work. She selected each Minx nail covering according to my nail size and shape before curing it under the lamp for about 10 seconds. She then painstakingly and meticulously placed the coverings onto my nails one by one, ran over them with a pusher, folded the ends over the pads of my fingers and allowed them to sit under the lamp for a few minutes. This was followed by careful, precise filing to ensure that each covering was exactly fitted to my nail. The process was finished with a short hand massage. The end result? Gorgeous, blingy nails that will make me the life of any party! And the best part? They should last for at least eight days with the proper care. Tracylee told me that to extend the life of Minx, they should be blasted with a hair dryer or held over a boiling pot of water and then pushed down with the cuticle pusher. This should be done every couple of days. To remove Minx, simply blast them with the hot air and then push from the cuticles forward. For more information on Minx or to find a Minx artist in your area, visit minxnails.com. And to follow Tracylee Percival on Twitter, click here! it looks amazing-- i LOVE it!!! Hello my name is dana, and I seen ur post I think ur nails look amazing which is the reason why I wanted to wear minx for myself. I live in vegas and I been doing a lot of research on them and went ahead and got them done, after she finished I was so upset they looked horrible I don't think the girl knew what she was doing they were peeling off that night so I go back to get them fixed and she did more of a lowsy job, so they made me an appointment to have it done by another nail tech and she was even worse man I'm upset the minx are all over my cutticle area and they are all cut ugly I'm sooo upset I'm losing faith in fashion in vegas, I had bad experience with my hair twice and now with the minx maybe I'm gonna have to go to ur lady if I want them to look good lol well had to get that off my chest sorry for the book lol. WOW! They look utterly amazing!!! Im going to check out their website now! Thanks for this!